Do you really finish projects? Based on my observation, I bet you don’t completely finish your projects. The lack of completion comes on two levels. You give up before the finish line, and you put the finish line at the wrong place. What do I mean? 1. We set a finish line at the start of a project. It includes process documentation and a picture of a completed project. Yet most project teams disband and move on before final deliverables are met. We just end at 380 meters (and move on to the next urgent project/race), rather than consciously running through 400 meters to the finish. 2. Our finish line never includes learning from the project itself—to make future activities and projects more effective and successful. You need to include this inside the project plan, otherwise it will never get done. Projects are long and grueling. People lose focus on the project. As a leader, we can manage all of these challenges to make sure we finish projects at a sprint, rather than a limp. 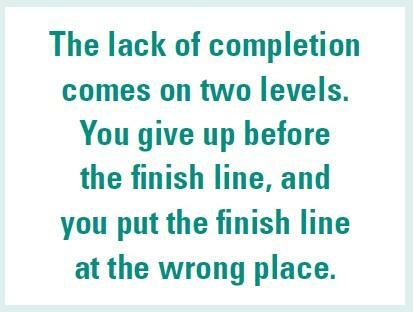 Set a clear picture of what completion is. Prioritize and re-prioritize. Scope creep is real and sometimes warranted. Don’t let it grow unabated. Look at the suggested additions and make re­­source decisions along the way. 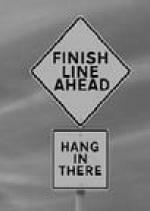 If the finish line changes, communicate the new finish line clearly. Keep people focused on the end point. Now include learning lookbacks—look­­ back and learn from the project. Learn for the repeat of that project next time. Learn from that project that we can generalize. To generalize our learning is to get the core lessons that we can transfer to other projects, situations, relationships and more. Learn how to learn from experience. Doing learning lookbacks achieves both of those things. Learning lookbacks give us a tangible place to exert our leadership influence by making sure that, in the glow of project completion, we don’t lose our opportunity to learn from all of the activity, (perhaps pain and frustration) and accomplishment. Here are four ideas to help you facilitate the process. Schedule specific time. This must be done as a separate task, probably as the only objective for a particu­lar meeting. Create an open environment. Discussing frustrations and mistakes must be en­­couraged—this is where much of the learning will come from. Focus on both direct and indirect (generalized) learning. Help people see the two types of learning mentioned earlier and help both surface. Celebrate success! The things that went well and need to be repeated need to be identified and celebrated! Projects are too important to not finish them, and as a leader, you can influence how and when projects end and make the ending strong.